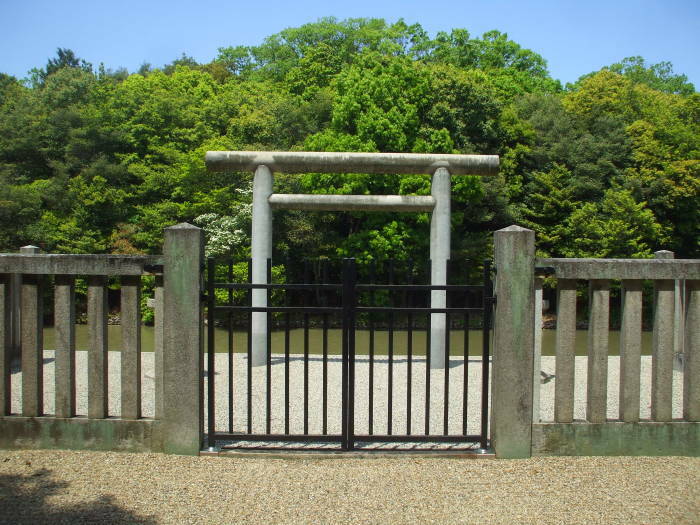 Google Maps labels this as the Mausoleum of Empress Hibasuhime-no-mikoto. The suffix -no-mikoto is a common honorific for the names of gods, meaning something like "the grand, the great, the exalted". I went north from the previous kofun along the small road running along its east side. 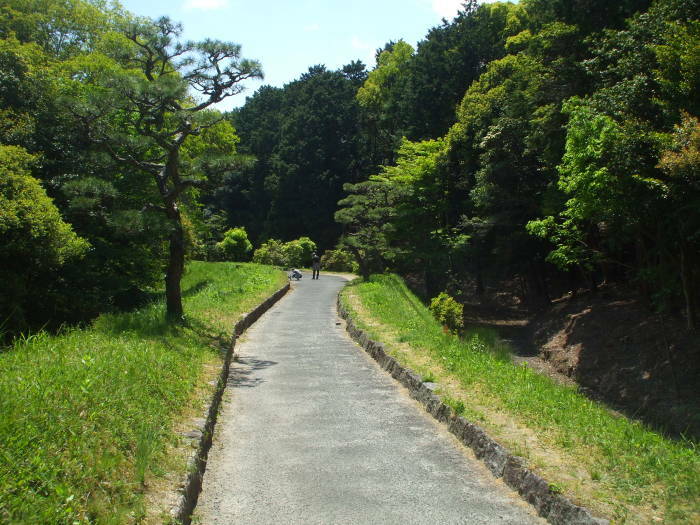 Then I took the road branching to the west, until I came to the lane curving to the south along the narrow divider between this kofun and the Kofun of Emperor Seimu. They have their own narrow moats, and the narrow lane between them is on the strip between the moats. In the first picture below I am at the northwest quadrant of the circular mound, looking along the moat across its top edge. 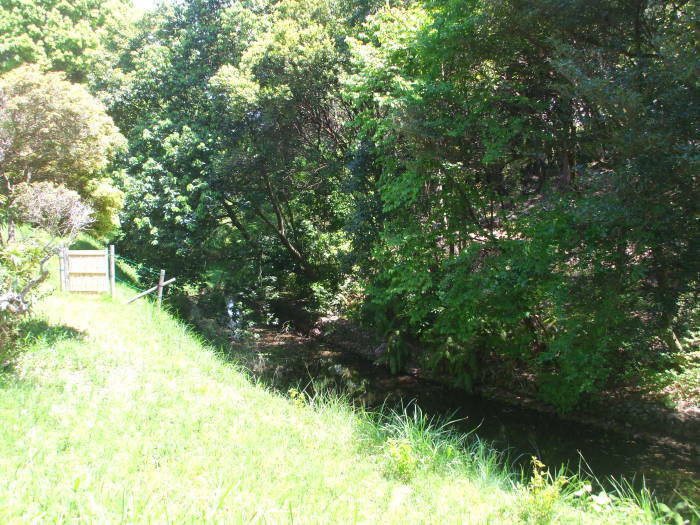 The pictures above and below show how the narrow lane runs on a strip that's like a dike separating the moats of the kofun of Empress Hibasuhime, at left in both pictures, from the kofun of Emperor Seimu, at right. 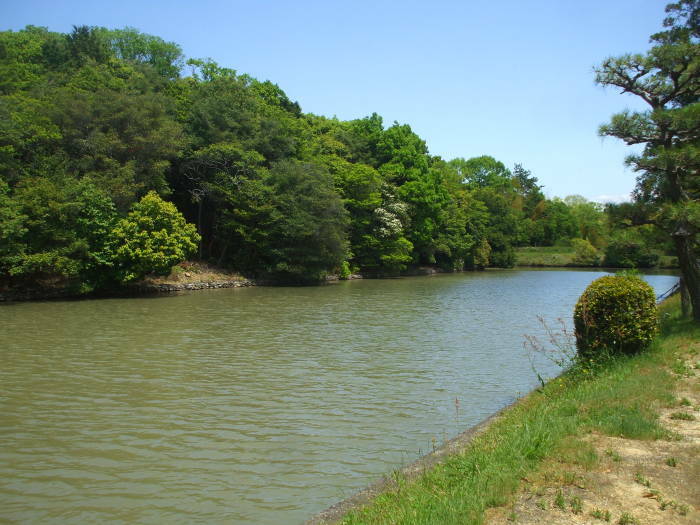 We come to the southwest corner of the rectangular area at the bottom of the kofun, and see the broad moat across the bottom end. The area for visiting or viewing again has two layers of fence separating you from two areas of raked gravel. The torii is about a meter away from a steep drop into the moat. Sanjohachiman Shrine is just south of this kofun, it is directly behind us in the above two pictures. 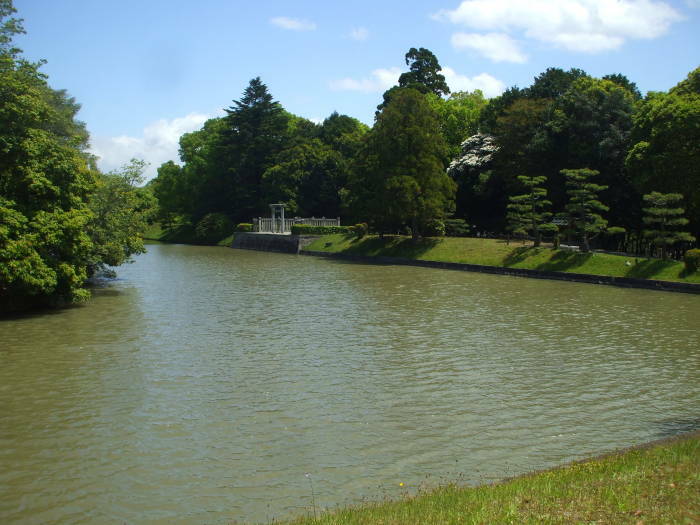 In 1915 (Taishō 4th year), relics were brought out with massive illegal digging. After that, the criminal was censured afterwards, and the excavated remains were collected. 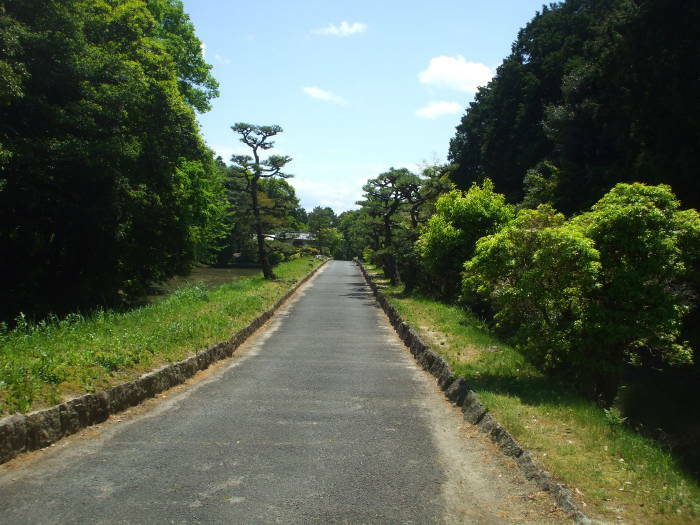 In the following year, the restoration work was carried out by the Miyauchi Province, and it seems that considerable detail investigations and records concerning the stones and the excavated artifacts were made, although it is presumed that there was a big constraint from the character of the monks. 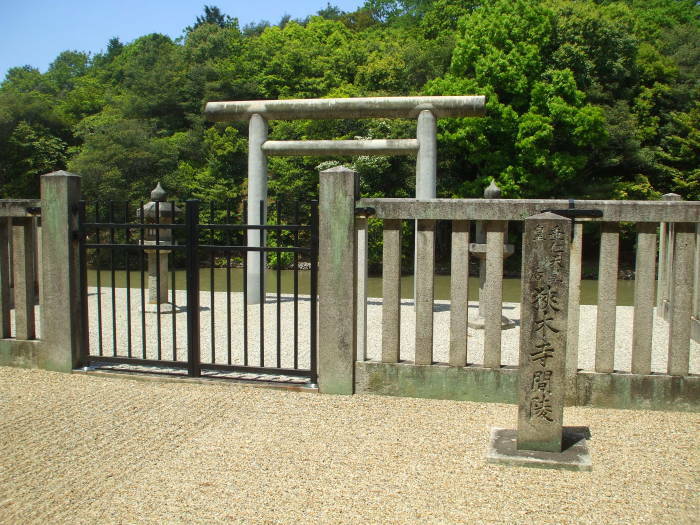 A large-scale grave robber was caught in 1915, and some archaeological details were recorded when the theft was inventoried and the kofun was restored. Let's see how much I can understand of the auto-translated content. Please look at it yourself if you can read Japanese and let me know what to correct. The long eastern and western walls were made from relatively small stones, but the north and south ends were each a single large stone with a hole in the upper half. This design is unusual, with the Matsudakeyama Kofun in Kashiwabara City, Ōsaka Prefecture, being the only other known example. It is assumed that a long wooden coffin once lay inside the stone tomb, but nothing of that remained at the time of the survey. The rectangular tomb chamber had five ceiling stones with protrusions thought to be used to lower them into place with ropes. A single large stone that looks like a sarcophagus lid was placed on the ceiling stones, it had a pattern of parallel carved into its upper surface. It is thought to be a form of amulet. The tomb chamber was buried under about two meters of earth. Several haniwa or terracotta pieces were found near the tomb chamber. A circle of 7 or 8 clay rings (or tubes?) shaped like kanugasa or kinuugasa (whatever that is) along with several clay shield-shaped pieces were placed on that mound, and then buried under further additions of earth to the mound.. The pieces shaped like kanugasa or kinuugasa were 1.5 meters high and 2 meters wide. The shield-shaped ones were 108 cm high with a maximum width of 80 cm. Some plaster models were made of these, and given to the Tōkyō National Museum. A copper mirror was among the grave goods found in the tomb chamber. Google doesn't do nearly as good a job translating Japanese as it does Indo-European languages like French. It elaborated that the copper mirror was "a cloud cloud transformation deformity direction regulation rectangular mirror". Also, terracotta haniwa representing wheels, roosters, swords, axes, a tall cup and a chair. Also, tubular beads. The report says that it's possible that some of the items came from a different looted tomb. I would guess that it remained a mystery because the perpetrator had been quickly executed for defiling an Imperial grave. Mirrors and beads were magical items. They commonly appeared in grave goods. In the middle and later Kofun period, weapons and horse gear began to be included. The Three Imperial Regalia are the mirror, sword, and curved jewel or magatama, the three sacred objects associated with the Imperial Family. They had become important religious symbols by the middle of the Yayoi period, and they have been found in those tombs of the Kofun period that have been excavated. 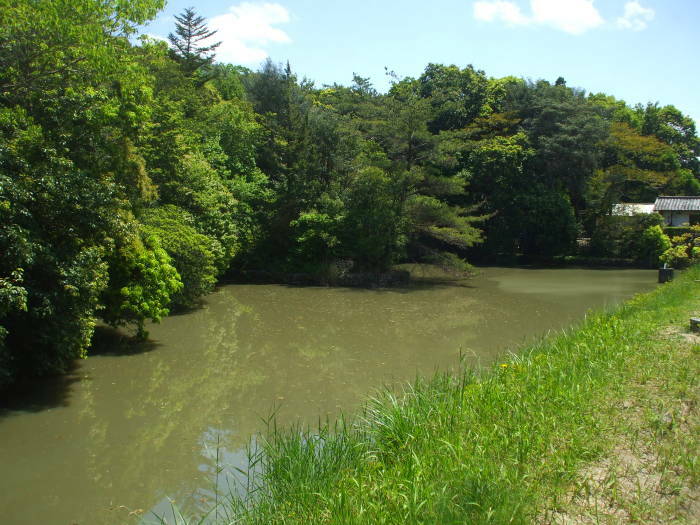 Of the three, mirrors are the most commonly found in Kofun tombs. Mirrors had been imported from Korea, and later from China, before the Kofun period. They may have served as a representation of Amaterasu, the Sun Goddess and ancestor of the Emperor. Or, it could have been a talisman to ward off evil. We don't know whether the ideas were imported from the contient along with the mirror, or if the imported mirrors were seen as useful symbols of existing ideas. The sword might be a symbol of male virility. Jomon period stone phallic symbols had evolved to look more like swords. Then bronze swords and spears were imported from Korea in the early Yayoi period. Ritual forms of these swords and spears began to be manufactured in Japan later in the Yayoi period, and they were common in Kofun burials, especially the later ones. The magatama or curved jadite jewel remains more mysterious. They appear to represent the soul. They are common in Kofun burials and in Korean sites of the same age. Magatama have been found in Yayoi sites, and in some Jomon period sites as early as about 1000 BCE, which is long before they appeared in Korea.